Your Sales Orders, Reports and Dashboards display summaries of activity by Seasons provide you with useful information to help you manage decisions about your business (e.g. when production orders need to be released for a particular season, whether to retire a season, etc). Understanding how these work and how they are displayed throughout Stitchex when multiple seasons are involved on Sales Orders is key to helping you make these decisions. When your customer places their order on your eCommerce store, they may browse multiple Seasons. Or, if you manually create the sale, you may not know which Season(s) the customer will want to purchase from (e.g. for walk-ins or phone orders). 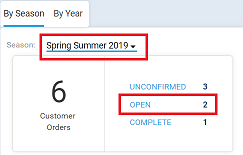 Even if you have multiple products on that order from 20 different seasons or zero products on that order from that originating season, the originating Season is the only one that will be displayed. Your Dashboard also shows the Sales Order originating season rather than individual line item season. The Sales By Retailer by Season Report is broken down by the Season of the individual line items on the order rather than the Sales Order season because it totals ALL orders and line items for the customer on this report.